Did you know that compared to New Year’s Day, the second highest number of healthy eating resolutions are made the day after the Super Bowl? 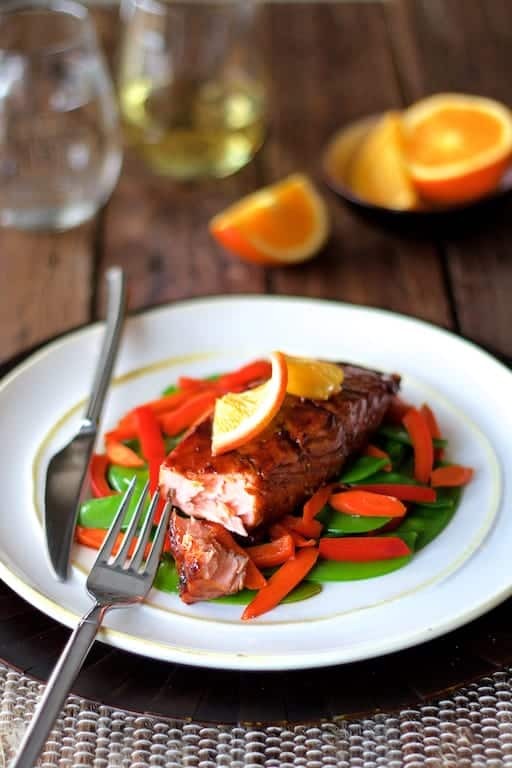 No matter when you make your healthy eating resolution, this healthful and light pomegranate and orange-glazed salmon with stir-fried vegetables will help you keep it. In this dish, pomegranate juice, orange juice and soy sauce are reduced to a syrupy glaze. Chili garlic paste is then added for a touch of heat along with dark brown sugar which adds a touch more sweetness and a light note of molasses. Mwaaahhh! Perfect with salmon! Wild salmon is always your best choice. The season for fresh wild salmon has passed, however, many fish counters carry wild salmon which has been thawed year-round which is labeled “previously frozen.” You should be able to find frozen wild salmon in the frozen seafood section. Try to avoid regular farmed salmon. Some farmed salmon such as Verlasso brand have earned a “Good Alternative” ranking from the Monterey Bay’s Seafood Watch program which promotes awareness of sustainable seafood choices. 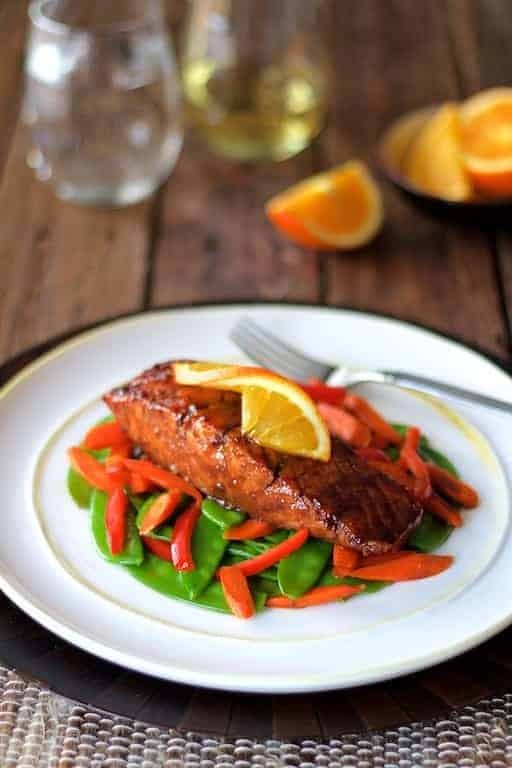 I served this beautiful pomegranate and orange glazed salmon over a colorful combination of stir-fried carrots, red bell pepper and snow pea pods splashed with a bit of soy sauce. I blanched the snow pea pods before adding to the stir-fry because I wanted to set the color. This blanching technique works well with any green vegetable. Simply get a pot of water boiling, add a generous amount of salt, drop the green vegetable into the salted, boiling water, then remove after it turns a bright green (which only takes seconds). Immediately drain and immerse into ice water to stop the cooking process. A side of brown rice or quinoa is the perfect accompaniment. Prepare an ice bath. Bring a small saucepan of water to a boil. Add salt then snow pea pods, cook 10-15 seconds, drain and immediately immerse into ice bath. Drain again and pat dry. Set aside. Combine pomegranate juice, orange juice and 2 tablespoons soy sauce in a small saucepan. Bring to a boil, reduce heat and simmer on medium-low 20-25 minutes or until reduced to approximately 1/3 cup with a syrup consistency. Stir in chili garlic paste and dark brown sugar. Set aside. Lightly oil a glass or ceramic baking dish. Heat a sauté pan over medium-high heat. Add 1 teaspoon canola oil. Season salmon fillets with salt and black pepper. Add salmon fillets to pan and cook until nicely browned, 2-3 minutes per side. Transfer to prepared baking dish. Pour glaze over salmon. Transfer to oven and bake approximately 15 minutes until cooked through to 145 degrees or desired doneness, brushing once with glaze in the pan. While fish is baking, heat remaining oil in sauté pan. Add carrots and cook 2 minutes, stirring constantly. Add red bell pepper and cook 2 more minutes. Add snow pea pods and cook 1 minute or until just heated through. Add remaining soy sauce. To serve, place fish over vegetables and drizzle with any remaining glaze in the pan as desired. Garnish with orange slices. 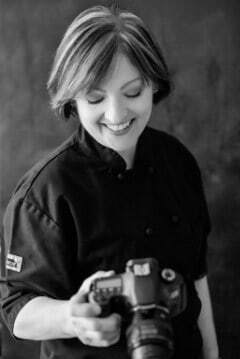 What a fabulous dinner – perfect for a weeknight, but also special enough for a romantic weekend or Valentine’s Day meal. I love salmon, usually grilled. But with this delightful glaze I’m convinced to do it in the oven. Perfect timing! I just bought some pomegranate juice to make homemade grenadine and I was wondering what to do with the rest of it!